Lucy Farnham ’22 took her first Spanish class in seventh grade, and it was love at first syllable. The Rochester native “dabbled briefly” in Chinese and German and has started learning Japanese. She’ll major in Spanish and possibly add Japanese as another major at the University. 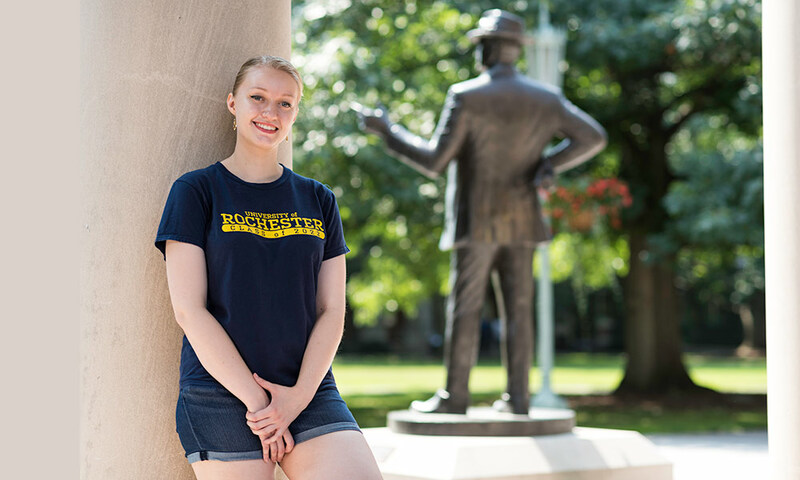 Farnham was an International Baccalaureate student at Joseph C. Wilson Magnet High School, just two miles from the River Campus, and says the University’s strong connection to the program “was a major factor” in her decision to apply. International Baccalaureate is a rigorous precollege educational system that emphasizes critical thinking. Rochester was the first university in the Northeast to offer scholarships to students with International Baccalaureate diplomas, and about 10 percent of the incoming class each year comes from IB schools such as Wilson Magnet. She also loved the freedom of the Rochester Curriculum. The University’s diverse student body was another lure. The Class of 2022 includes students from 76 nations. Farnham played varsity volleyball and softball in high school and says she and her friends are considering starting an intramural volleyball team at Rochester. She also plans to join the Japanese Students’ Association and perhaps Habitat for Humanity. “I really want to volunteer somewhere,” she says. She’ll be the first member of her family to graduate from college. Farnham is considering a career in the US Foreign Service, perhaps as a diplomat.